Free today, January 26th, on Amazon Kindle. This is my brand-new book. I hope you enjoy it! Sam’s quiet life as a New England bookseller and occasional lawyer is turned upside down when a tussle over a vintage children’s book turns him into the rescuer of a much younger woman. Jessie is a mysterious beauty with dark secrets—much darker than his own. FINDING JESSIE is an emotionally intense, heartbreaking modern gothic mystery romance about a woman’s lifetime quest for her sense of self and the man who is determined to discover the truth and save her…and their fragile relationship. If he cannot shatter the lies with facts and help her to overcome her history, she will disappear from his life. FINDING JESSIE is about love, lies, truth, betrayal, redemption, greed, mercy, and the triumph of the human spirit. A small angelic presence convinces Sam to take one last chance on this May-December relationship. FINDING JESSIE is his most fervent hope. 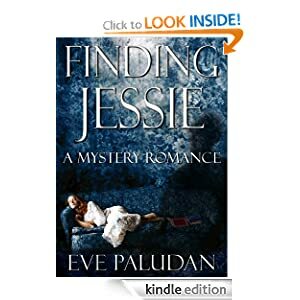 Author Eve Paludan tackles a controversial real-life topic with compassion and sensitivity: How far would you go to redeem your lover from a shocking, terrifying past?